My name is Leonardo Giacomo Borgese, I live and work in Milan, Italy. I am Master d 'art scene graduated from the Academy of Fine Arts of Brera in Milan, professional in the field of special effects and in the art of body painting. For more than twenty years working on TV sets, theater, film, photographic, advertising and all kinds of events both in Italy and abroad, working with production houses and advertising agencies the most important of Italy, for customers of fame international. Professor of special effects, design and founder of the first course of body painting in Italy issuing a certificate recognized. The course takes place at the European School of Beauty and Makeup BCM Milan. 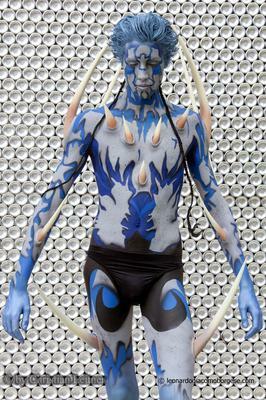 Very active in the world of body painting is often invited as a juror during the contests of this art.